Thiel and I are in his greenroom before he goes onstage at the Commonwealth Club of Silicon Valley — one of the friendlier turfs he’ll visit on the tour for his new book, Zero to One. Tall and thin with close-cropped hair and ageless skin, he’s gesticulating purposefully on a cheap-looking sofa, wearing a blue blazer over a shirt unbuttoned to his pectorals, a look that has the effect of making him appear less like a tech financier than a French philosophy student defending his dissertation. Thiel has avoided the glazed-over boredom found among authors forced to recite points from their books, which is admirable given the unusual length (seven weeks) and scope (Boston! London! Hamburg!) of his tour. He spoke to a standing-room-only crowd at Wharton, and enraptured a huge group of students at Harvard Business School, nearly all of whom wanted to work in tech. That made him slightly uncomfortable, since Harvard students piling into any one industry tends to be a sell signal. “There’s a study about how whatever the largest number of people at HBS do is the wrong thing,” he says, laughing. 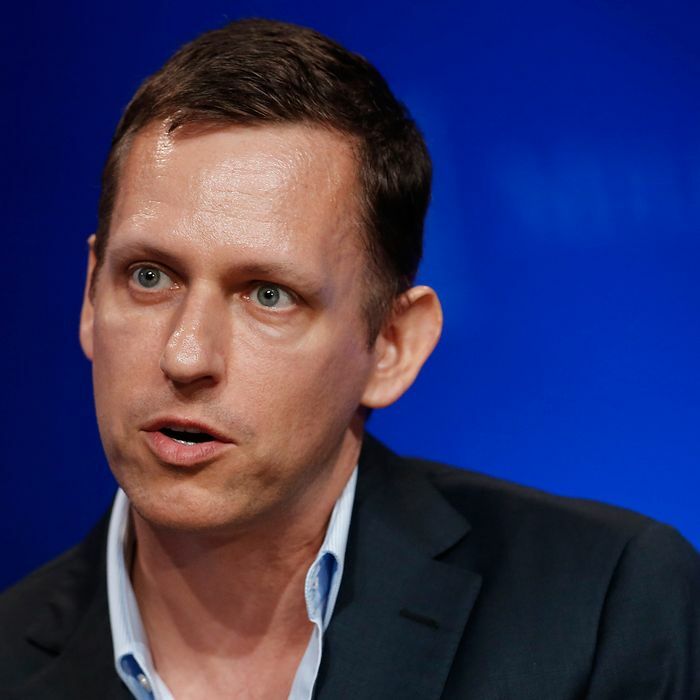 In person, Thiel is not unlike Peter Gregory, the space-cadet mogul in HBO’s Silicon Valley, played by the late Christopher Evan Welch, who was reportedly based on him. (“I’d never drive a car as small as the one he has,” Thiel says, when I ask about the comparison.) Like his cable doppelgänger, Thiel avoids eye contact, pauses mid-sentence to roll words around in his mind, and lapses into silence so often that interviewing him feels, at times, like attending a Quaker meeting. When he does speak, he refines and revises on the fly, ironing out imperfect turns of phrase as if debugging lines of code. Zero to One is perhaps a better vehicle for his ideas. One of the few business best sellers that doesn’t feel like it was wrung out of a ghostwriter at gunpoint, the book is an enjoyable collection of solid start-up advice, based on a class Thiel taught at Stanford in 2012, that he hopes will serve as a pep talk for a generation of young entrepreneurs. Much of what’s in the book is cheerfully contrarian — monopolies are good, disruption is bad, luck isn’t always related to success — and there’s a certain appeal to Thiel’s go-getter attitude about the future, one in which everything from fixing climate change to colonizing Mars will simply be a matter of assembling bright technologists to build good businesses. So once people see Amazon drones flying over their heads, they’ll fall for them?